April 2011 marks the 150th anniversary of the Civil War. Like other Massachusetts communities, when Abraham Lincoln called, Littleton sent 4 men in the Sixth Regiment Massachusetts Volunteers to protect Washington DC. The members of the regiment when its numbers were fully made up were scattered over four counties Middlesex, Essex, Suffolk, and Worcester and in more than thirty towns and yet with but a few hours notice the bulk of them mustered early on the morning of the 16th and the rest within a few hours after- making in all about seven hundred men and officers ready at this first call to don the armor of actual war. The Sixth Regiment reached Baltimore on the 19th of April 1861. A peculiar Baltimore ordinance called for all passing trains to stop at the President Street Station, have the railroad cars slowly pulled along the tracks by horses, then hooked back up to steam locomotives at the Camden Station ten blocks west to continue their journey. It was while the nervous troops, packed into their railroad cars, were being pulled those ten blocks by horses along Pratt Street that the crowd attacked. Six of the railroad cars made it through before the crowd blocked off the track and the horses could go no farther. The remaining men, around 250, had to get out and march to Camden Station. The howling mob descended upon them, and the riot quickly turned into a bloody battle. Four soldiers and twelve civilians were killed. “Four ” Minute Men ” will follow the flag no longer for stretched on the pavement of the Monumental City lie the bodies of Ladd, Needham, Taylor and Whitney, the first offerings in that terrible holocaust of war which for long years, was to consume the best the nation had to give. Night beholds them camped within the Nation’s Senate Chamber and as Abraham Lincoln grasps each Massachusetts man by the hand, he proclaims his gratitude that all the people have not become unnerved by the spirit of trade and that there were yet men who were willing to offer themselves for the defense of their country, and the ” Minute Men ” slept with the comforting assurance that their arrival had rendered safe the seat of the National Government. 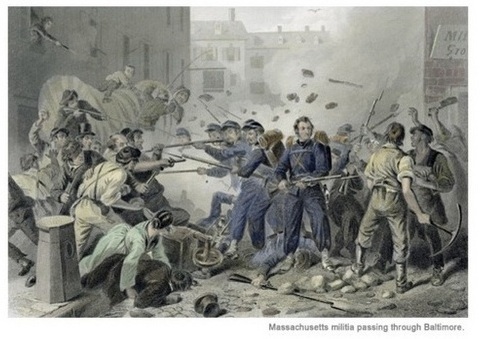 “The Sixth Regiment of Massachusetts Volunteer Militia, Col. Jones, has returned home. It was the first which went forward to the defense of the national capital. It passed through Baltimore, despite the cowardly assault made upon it, and was the first to reach Washington. It’s gallant conduct has reflected new lustre upon the Commonwealth,and has given new historic interest to the 19th of April. It has returned, after more than three months of active and responsible service. It will be received by our people with warm hearts and generous hands. The regiment is now dismissed till further orders. Thirty-seventh Congress of the United States, at the First Session, in the House of Representatives, July 22, 1861. Edward Delos Battles was born in Boxboro 5 April 1838 to Josiah and Mehitable (Shumway) Battles. Josiah Battles was born in Oxford, Massachusetts. He married Mehitable Shumway 30 November 1829 in Oxford and sometime between 1830 and 1838 they moved to Boxboro. He is listed in the Boxboro1840 census with one male child under 5 years old. In the 1850 Boxboro census, Josiah and Mehitable are listed with William H 9 years old but not Edward. However, there is a 12 year old child named Edward Battles living with Martin Woods in Littleton, Ma. On 23 December 1872 at Acton, Edward married Adelia Bennett, daughter of John and Sarah (Jones) Bennett. His birth is listed as Littleton, his residence is Acton and he is a farmer. Sarah was born in Burlington, Vermont. By 1880 they are living in Waterbury, Vermont and have at least 2 children William E and Frank. Edward died 1896. The following information was found on Ancestry.com which indicates his continued service to the Union after being mustered out of the 6th Regiment. South Framingham, Aug 11- Yielding to the desires of his many friends,Hon George A. Reed of Saxonville announces that he is a candidate for renomination for the state senate. Representing the 4th Middlesex district for two years past, he comes a candidate in the new 1st district, whose principal cities and towns are Newton, Marlboro, Framingham, and Natick. Senator Reed’s name has been mentioned in connection with the nomination to congress in the 4th district, to succeed Mr. Apsley, but he announces that he is in no sense a candidate for that position. Hon and Mrs. George A Reed will receive their friends at their home, 110 Danforth St. Saxonville, from 3 to 5 tomorrow on the occasion of the 50th anniversary of their wedding. The affair will be entirely informal, owing to the condition of Mrs. Reed’s health. Mr. Reed for about 45 years was trainman and conductor of the Saxonville branch train, retiring in 1919, when he reached the age of 70. He has been selectmen and represented Framingham in the lower house of the General Court in 1889 and in 1895 and 1896 represented the old Fourth Middlesex District in the Senate. He is a Civil War veteran, and commander for several years of Gen. Burnside Post G.A.R. Charles Reed, aged 65, a well known Westford farmer, was the victim of a fatal accident while driving home about 9 o’clock last evening. He was thrown from his wagon into an excavation, his horse falling in on top of him. He lived but a few minutes after the accident and was dead when taken out of the excavation. For the past week workmen have been settling a catch basin in the street directly in front of John C. Abbott’s residence. While passing this point last evening the horse which Mr. Reed was driving shied suddenly to one side, throwing the driver from his seat into the excavation. In its effort to get away the animal attempted to jump the hole and fell in on the unfortunate man, crushing him severely and causing internal injuries which resulted in his death a few moments later. The horse struggled and finally released itself from the wagon and reached the surface again. The commotion attracted the attention of several people and they removed the body of Mr. Reed to a nearby house and a physician was called. Undertaker D. L. Greig took charge of the body. It was said that several lanterns were placed about the excavation so that to drive into the hole unknowingly would be quite impossible. Deceased was a veteran of the Civil War and had no living relatives, so far as is known. Reed- The funeral services of Charles W. Reed, who was thrown from his carriage last week and instantly killed, were held from his home in Westford at 2 o’clock Sunday. There was a large attendance of relatives, neighbors, and friends. Rev David W. Wallace of the Union Congregational church was the officiating clergyman. The bearers were George A. Reed, William E. Reed, Murray Lynds, Harry Weston, George Voter, and Sumner Lyncoln. Undertaker David L. Greig was in charge. Burial was at Littleton. Deceased was a member of the old Sixth Massachusetts regiment, Company E, and afterward reenlisted and served during the remainder of the war in the 35th Massachusetts regiment. He is survived by a widow, one brother Hon. George A. Reed, of Framingham, Mass and four sisters, Mrs. L.A. Rhoads of Ayer, Mrs. N. R. Gerald of Cochituate, Mrs. W.H. Swallow of Campden, NJ and Miss Mary Reed of Cochituate. Among the floral offerings were: spray, feverfew and pinks, from wife; spray lillies and sweet peas, from Mrs. Lucy Rhoads; crescent of roses and pinks, Mr. and Mrs. George Reed; bouquet of white roses, Mrs. Gerald and Miss Mary Reed; spray narcissus, Mr. and Mrs. J. M. Lynds; spray pinks and roses, Dr. and Mrs. W. Reed; spray of palms and pinks, Dr. and Mrs. H. Weston; spray pinks, Mr. and Mrs. Charles Davis and son; spray of pinks, Mr. and Mrs. Kahlo and Mr. and Mrs. Krouse; wreath, Mr. and Mrs. Albert Jeune; bouquet of pinks, Mrs. Weston and Mrs. Mothrup; spray of pinks Mr. and Mrs. W. M. Wright; wreath, Mr. and Mrs. Stephenson. James Lewis Durant was born in Littleton 26 May 1835 to Reuben and Hannah Durant. James deserted 20 April 1862 at Carlisle Bks PA. He died in Shirley 4 April 1902. Be a contributor to Littleton’s “photo album” of pictures showing how the town has grown and changed. The Historical Society invites residents to share their pictures of the town’s people, places, and events – photos which indicate the history of our community and its spirit. Photographs are needed for the Historical Society’s Book to be published in 2014 for the town’s 300thAnniversary, and to add to the coverage, quality and quantity of photographs in its collection. Once you have selected photographs to share, please make a list of each photo on a piece of paper and identify, if possible, the location, names of people, date when taken, and who took each picture. You can bring the photos and your list to the Historical Society any Wednesday afternoon from 1 to 4 PM (except the day before Thanksgiving, or on the first and third Saturdays of the month from 10 AM to Noon. Photographs will be scanned and returned to you. Owners will be asked to sign a release form for the Society to use digital copies for possible inclusion in the 300th Anniversary Book, and keep them in its collection. The original photos will be available in about a week for owners to pick them up at the Society. Click Here to download the permission form to print and send (right-click and click Save to download, or just left-click to load in most browsers) or if you would like to email the form to the Society, please click here (email release form). Thank you for providing the photos worth thousands of words to show the history and spirit of Littleton. Assistant to work with current editor – position requires someone with extensive experience in editing, and who has vision and enthusiasm, problem-solving abilities, and good interpersonal skills. Experience in preparing history-related publications is a plus. Writers and researchers to prepare articles about Littleton’s history, especially in the years between 1960 and 2012. The 300 Book Group was organized in May 2010. Its members are enthusiastic and work collaboratively to prepare accurate historical information about the town’s past. The work is challenging and rewarding. Members support each other and are a great group to work with. If you are interested, please call Ann Himmelberger, Chair of the Book Committee, at ahhimmelberger@verizon.net or 978-742-5960 for more information about these opportunities. WHY PUBLISH A BOOK ABOUT LITTLETON’S HISTORY? It’s the 21st Century, the era of technology, why do we need a book about Littleton’s history? In the first decade of the 21st century, the urge is to be connected – wired to what is happening around us. We also have a need to be connected to people and events of the past that have shaped us and the place where we live. Stories of the past give meaning to our lives, and are a key to understanding our place in the world. Are there any books about Littleton’s history? 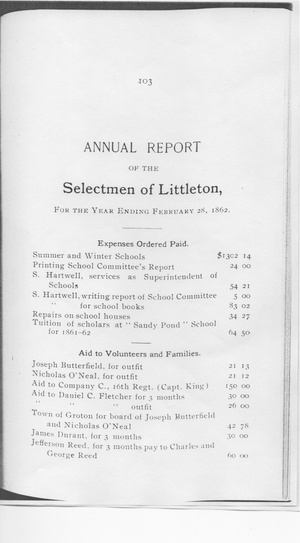 Almost 50 years ago, Carolyn Webster wrote Highlights of Littleton’s History, a more recent account included in the 250th Anniversary Program Book in 1964. Copies of the paper-backed program are in the collections of the Reuben Hoar Library, and the Historical Society, but are not generally available elsewhere. Much has happened in Littleton during the years that have intervened since these accounts were written. A current book should be written to include the events of the 20th century as a significant part of the town’s past. Another reason for re-examining our town’s history is that recent trends in historical research have expanded interest about people and topics that were not included in earlier accounts of the past. Uncovering stories about those who might have been overlooked before can enhance our understanding and appreciation of the past. Some information about the town’s history can be found by looking it up on-line. However, a glance at Wikipedia, for example, reveals inaccuracies about historical facts, and gaps in information that present a distorted version of the town’s past. Generally, historical accounts on-line do not provide sources of information and hence cannot be researched. Instead, the material is a collection of unreliable fragments pasted together and unrelated to historical events taking place at the time. Why not publish a book for Littleton’s 300th Anniversary? Littleton’s Tercentenary provides us with a once-in-a-lifetime occasion to celebrate our hometown. It’s the perfect opportunity to create a long-lasting and significant contribution to benefit the town. Writing and publishing a book will take time, effort, thought, and money. However, the value of the Tercentenary Book far outweighs the costs. To celebrate the 300th Anniversary, it is now time to prepare an inclusive, accurate, and up-to date record of the events and people that shaped the town where we live.